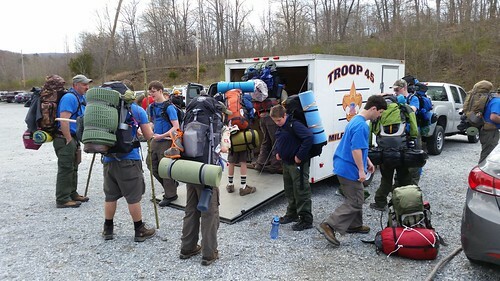 In early May, Troop 45 assembled its group of lightfighters and headed to West Point. 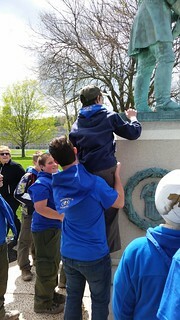 We were lucky enough to win the draw as a new troop to the Camporee, joining about 7,000 other people for this awesome event. We woke up early on Friday, arriving in New York in the early afternoon. After a 4 mile hike through mud and over mountains, we arrived at the training grounds of the worlds foremost military academy where we promptly configured our camp in the tightest quarters we’ve ever camped. 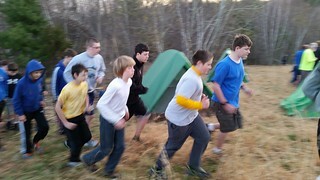 The boys awoke to the sounds of cadets waking them for an early morning PT (Physical Training) session. While it still took a while, they managed to wake even our sleepiest campers. After finishing up their exercises at “O my gosh its early hours”, the boys ate breakfast and headed out for the day. 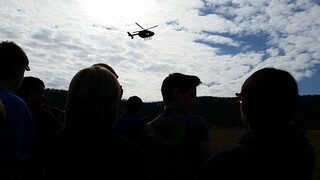 Among their activities, they learned to tie rope harnesses, checked out military weapons, participated in a mock tactical exercise, watched a helicopter assault on the parade ground and had the coolest scouting bonfire I ever saw (complete with a live band). By the end of the day, everyone was exhausted, but they all had an experience they’ll never forget. On Sunday morning, we hiked back out of camp to our vehicles. Once we arrived, we drove into West Point, proper, and took an hour long bus tour of the Academy. I think we were all amazed at the beauty and history of the place. Many of us want to go back because we only saw a glimpse of everything there. It was all quite impressive. While the entire weekend was amazing, it was capped off by our adults’ participation in the Scoutmaster Chili Contest. Greg did an awesome job coordinating our various assistant scoutmasters and carrying in extra gear in order to position our troop for the best shot at the title. Despite his valiant efforts, it appears that a pumpkin pie won the chili contest.